Americas biggest open house in Summerlin real estate showcased 75 model homes for sale. 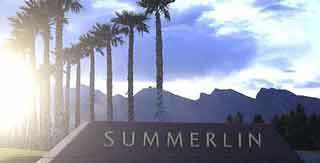 Summerlin is located in west valley of Las Vegas real estate. The developer of Summerlin, Nevada, is The Howard Hughes Corp. They planned an entire two days, March 15 and 16 of 20 neighborhoods with activities and incentives to attract potential new home owners to their master plan. This year the Summerlin master plan dropped to number 8 as the best selling. For most of the 1990’s they held the coveted number one position. Americas largest open house is the third time they were host to this event. 12 new home builders are offering their plans to new home buyers. It has been such a success that during October 2008 will be Summerlin’s fourth America’s Biggest Open House. In the past decade and a half the master plan has grown to well over 95,000 residents. There is a wide range of homes including, condos, townhomes, single family and luxury Las Vegas homes. Prices start in the mid $200,000s. Some of the luxury Summerlin homes include locations on a golf course with beautiful views of the Las Vegas Strip. There is plenty of room for home buyers to purchase homes in Summerlin with 9,000 acres available for growth including Summerlin Centre. 13,500 acres have been developed in the master plan. Residents can enjoy the many outdoor activities and amenities that Summerlin offers 150 miles of trail system, village parks and nine golf courses including TPC Summerlin. If you are looking for popular floor plans Summerlin homes are offered in many styles including custom homes in The Ridges. Call 702-505-6988 for VIP Summerlin real estate search with a Las Vegas real estate agent. Americas Biggest Open House in Summerlin real estate showcased 75 models.